Himmelskönig, sei willkommen (King of Heaven, welcome), BWV 182, is a church cantata by Johann Sebastian Bach. He composed it in Weimar for Palm Sunday, and first performed it on 25 March 1714, which was also the feast of the Annunciation that year. In Weimar, Bach was the court organist of Johann Ernst von Sachsen-Weimar. On 2 March 1714, he was promoted to Konzertmeister, an honour which included a monthly performance of a church cantata in the Schloßkirche. 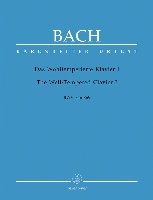 According to Bach scholar Alfred Dürr, this cantata is Bach's first cantata for the court of Weimar, in a series which was meant to cover all Sundays within four years. It preceded Weinen, Klagen, Sorgen, Zagen, BWV 12. Bach first performed it in the Schlosskirche on Palm Sunday, 25 March 1714. Other than in Leipzig, where tempus clausum was observed during Lent and no cantatas were permitted, Bach could perform in Weimar a cantata especially meant for the entry of Jesus into Jerusalem. The prescribed readings for the day were from the Epistle to the Philippians, "everyone be in the spirit of Christ" (Philippians 2:5--11), or from the First Epistle to the Corinthians, "of the Last Supper" (1 Corinthians 11:23--32), and from the Gospel of Matthew, the entry into Jerusalem (Philippians 2:5--11). The poetry was written by the court poet Salomon Franck, although the work is not found in his printed editions. Bach's biographer Philipp Spitta concluded this from stylistic comparison and observing a lack of recitatives between arias. The poetry derives from the entry into Jerusalem a similar entry into the heart of the believer, who should prepare himself and will be given heavenly joy in return. The language intensifies the mystical aspects: "Himmelskönig" (King of Heaven), "Du hast uns das Herz genommen" (You have taken our hearts from us), "Leget euch dem Heiland unter" (Lay yourselves beneath the Savior). The chorale in movement 7 is the final stanza 33 of Paul Stockmann's hymn for Passiontide "Jesu Leiden, Pein und Tod" (1633). A da capo sign after the last aria in some parts suggests that originally the cantata was meant to be concluded by a repeat of the opening chorus. As Bach could not perform the cantata in Leipzig on Palm Sunday, he used it on the feast of Annunciation on 25 March 1724, which had coincided with Palm Sunday for the first performance. He performed it in Leipzig two more times. The cantata is intimately scored to match the church building. 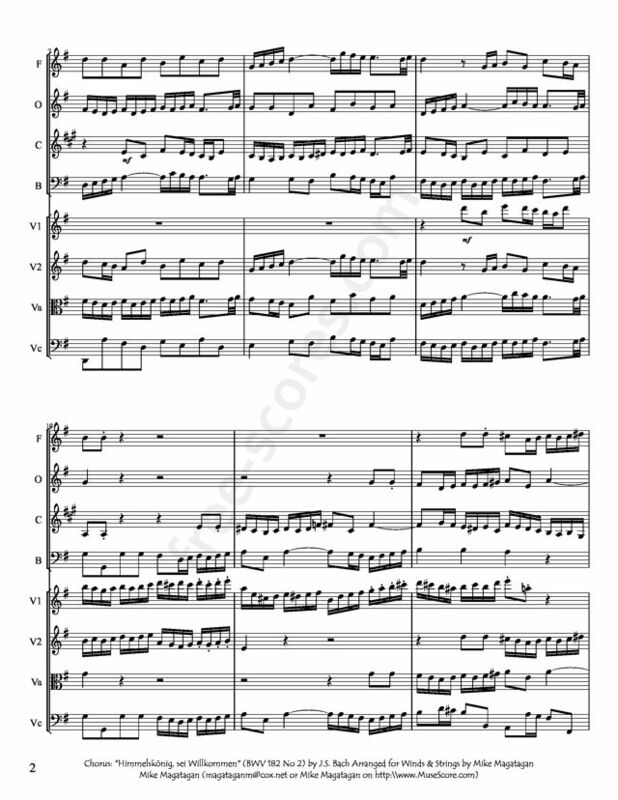 An instrumental Sonata in the rhythm of a French Overture depicts the arrival of the King. (In his cantata Nun komm, der Heiden Heiland, BWV 61, for Advent that same year on the same reading, Bach went further and set a chorus in the form of such an overture). 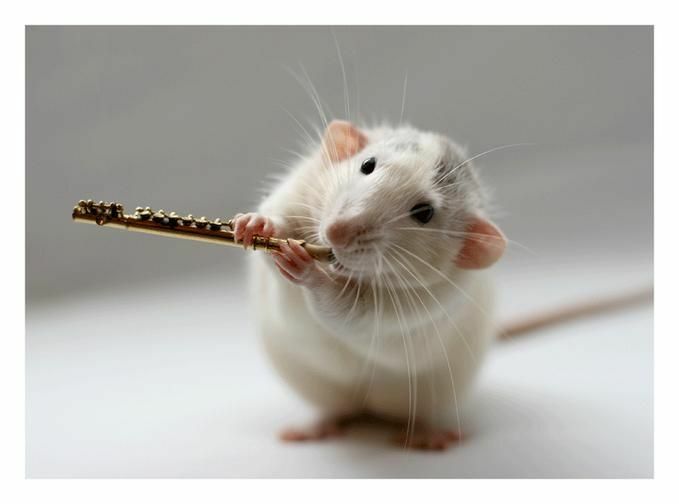 The recorder and a solo violin are accompanied by pizzicato in the divided violas and the continuo. The first chorus is in da capo form, beginning with a fugue, which leads to a homophonic conclusion. The middle section contains two similar canonic developments. The following Bible quote is set as the only recitative of the cantata. It is given to the bass as the vox Christi (voice of Christ) and expands to an arioso. 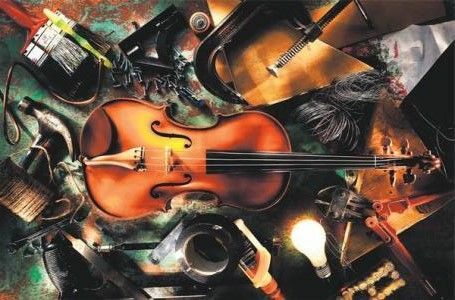 The instrumentation of the three arias turns from the crowd in the Biblical scene to the individual believer, the first accompanied by violin and divided violas, the second by a lone recorder, the last only by the continuo. 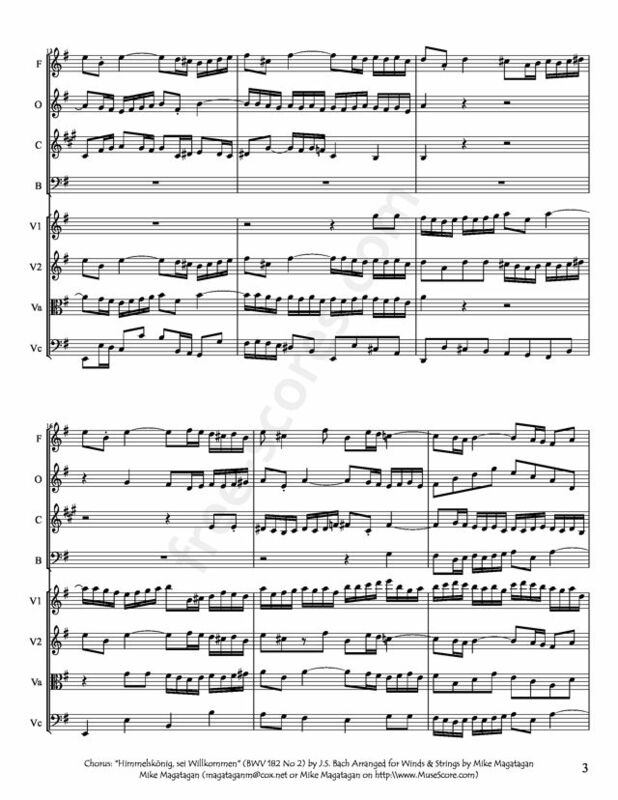 The chorale is arranged in the manner of Pachelbel; every line is first prepared in the lower voices, then the soprano sings the cantus firmus, while the other voices interpret the words, for example by fast movement on "Freude" (joy). The closing chorus is, according to conductor John Eliot Gardiner, "a sprightly choral dance that could have stepped straight out of a comic opera of the period". 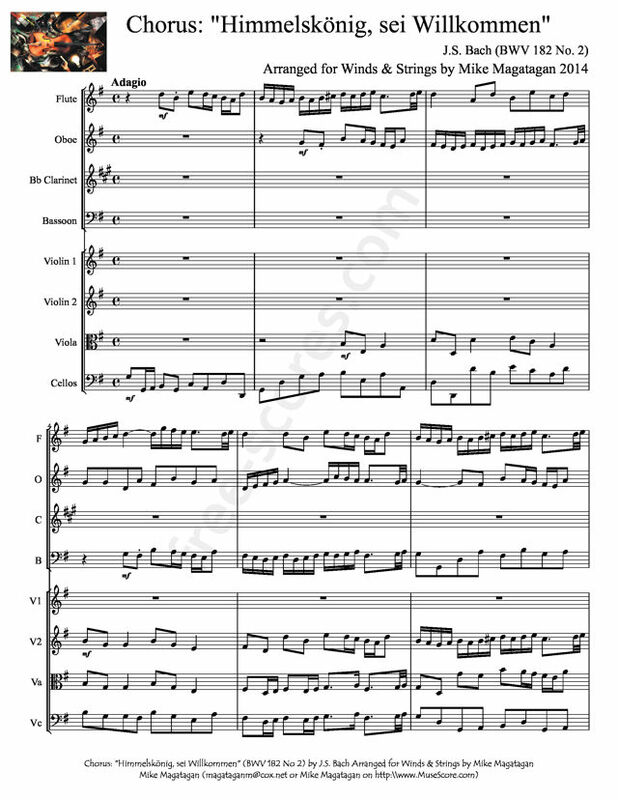 Although this cantata was scored for alto, tenor, and bass soloists, a four-part choir, recorder, two violins, two violas and basso continuo, I created this arrangement for Winds (Flute, Oboe, Bb Clarinet & Bassoon) & Strings (2 Violins, Viola & Cello).